Background: The decision to purchase the Tesla Model X was not one we came to lightly. Aside from the initially staggering price tag, it requires a complete overhaul of the way you think about traditional modes of transportation. We were already familiar with electric vehicles, having owned a Nissan Leaf for a few years, but understandably that was like transitioning from a bike with training wheels to a special edition Ducati. We conducted copious amounts of research on the Model X before setting foot in the dealership to determine if the price was truly justified. We soon discovered that not only was it worth it, but that owning one would connect us to a community of forward thinkers who are changing the world for the better. This video produced by Tesla sealed the deal. Consistent with a complete deviation from the traditional vehicle, the buying process was just as unique and refreshing. We started by visiting the Tesla store at Lenox Mall. Unlike every other dealership model, this felt like a non-predatory, educational experience. We were greeted by Apple Store-esque employees, who effused a genuine sense of enthusiasm and curiosity about the Tesla and our shared interest in it. We spoke at length with one such individual, Nick, who coordinated an appointment for an at-home test drive. A few days later, Nick came by (after-hours no less) and spent almost two hours explaining the Tesla's features and letting us drive through the neighborhood--impressing all the dog-walking neighbors. That night after debating the pros and cons, we decided to take the leap and order our custom Tesla. Again, here is an instance where this company has innovated the buying process, making it easy and bereft of any feeling of subjugation to a targeted sales agenda. 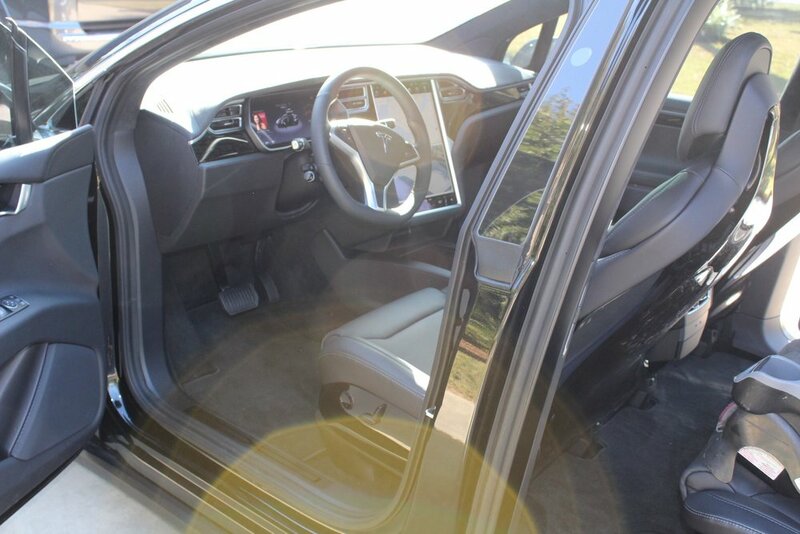 We customized our Tesla, choosing six seats, the larger 22" wheels, the premium upgrade package, autopilot, and designated the interior and exterior to be all black. Cumulatively, there weren't that many decisions to make, but ultimately there were enough to create a sense of ownership and artistic design. If you are purchasing a new Model X or S, use this link to receive $1,000 off. It truly is the hardest part. From the moment we clicked "Order" and paid the $2,500 production deposit, it was approximately two months before we saw our vehicle in the driveway. Upon ordering, we were immediately assigned a designated point of contact, ("POC") to guide us through the financing, production, and delivery process. We also received electronic updates on the vehicle's stage of production, i.e. "Ordering", "Confirmation", "In-Production", "Production Completed", and "Delivery". The production stage was by far the longest, and during this time we sated our thirst by daily visits the Tesla Motors Club Forum. It was there that we commiserated with others in the same stages of production experiencing similar longings, and were simultaneously invigorated with stories and experiences from others who had already received their Teslas, and were more impressed than they had expected. Like any group of individuals, there were those with a more negative view of the waiting requirement, whereas others understood the reasoning and value behind extended waiting due to the full auto-pilot upgrade and a more vigorous quality control approach. The waiting period only made the day of delivery that much more exciting. We were contacted by our designated POC to schedule an appointment to pick-up our Tesla, sign paperwork, and take the 2-hour training. The forum had prepared us for what training would entail, covering everything from opening and closing the frunk (front trunk as there is no need for an engine) to the major duties of the 14" control panel that quite literally controls all aspects of the vehicle. It was somewhat daunting at first, but we were comforted by the fact that the manual is also located on the control panel, and anything we forget is easily searchable. There are too many to list in detail here, but my favorites include the Falcon wing doors, the navigation (which indicates the location of all Tesla and non-affiliated chargers), the adjustable suspension, full autopilot capabilities, Slacker streaming radio, and the ability to schedule charging (electricity is cheaper between 11pm and 12am). Additionally, your phone's calendar can link to the Tesla and it will remind you of an event and ask if you'd like it to navigate you there. Lastly, when Tesla releases software updates improving the vehicle's energy consumption or simply a new phone icon on the control panel, installing is as easy and intuitive as an iPhone update. We recently tested our new vehicle on a 5-hour road trip from Atlanta, Georgia to Beaufort, South Carolina, and the results surprised us. I thought having to stop in Macon and Savannah to recharge would be irritating and time-consuming, but the reality is that it gave us time to stretch our legs, witness a little history, eat at an amazing local spot frequented by Harrison Ford, The Rookery, and bond with other Tesla enthusiasts. The result was a return the classical experience of a true road trip. Our family enjoyed every minute, and consequently it was one of the best trips we have ever had together. Mindfulness Matters. Here's How To Get Started.